What are the stages of the water cylce? Where does the energy come from for the water cycle to work properly? It is a hot summer day and you are enjoying a glass of ice water. Water appears on the outside of your glass. Explain what is happening? After it rains there are puddles in the streets and sidewalks, how do they disappear? How would you compare a Stratus cloud to a Stratonimbus cloud? You are the water molecule traveling through the water cycle. Describe your trip by including the places you go and the changes you see. Use vocabulary you have learned from this unit. Illustrate and show a map of your journey from your response to questions #7. In the image, what type of cloud is number 1? In the image, what type of cloud is number 3? 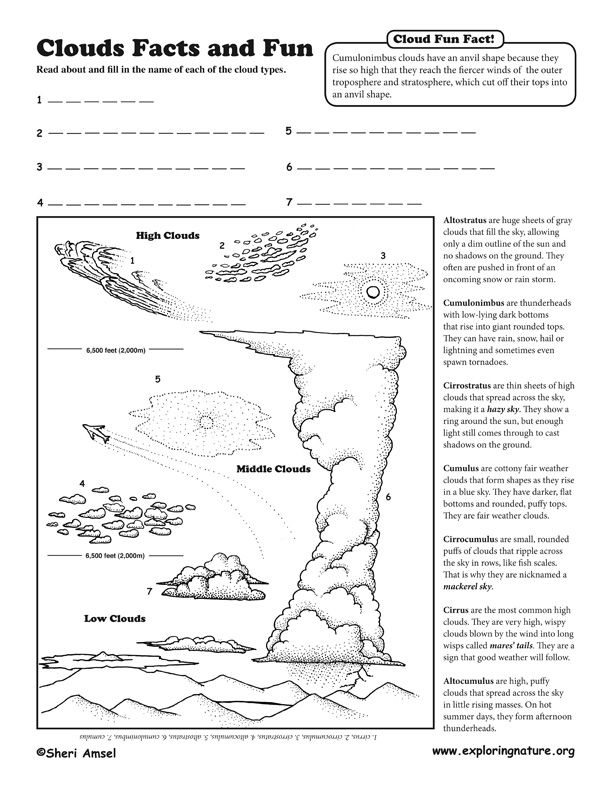 In the image, what type of cloud is number 6?